Sculptor Bill Reid, now at Tory Folliard Gallery, has created his own looniverse, as he puts it. 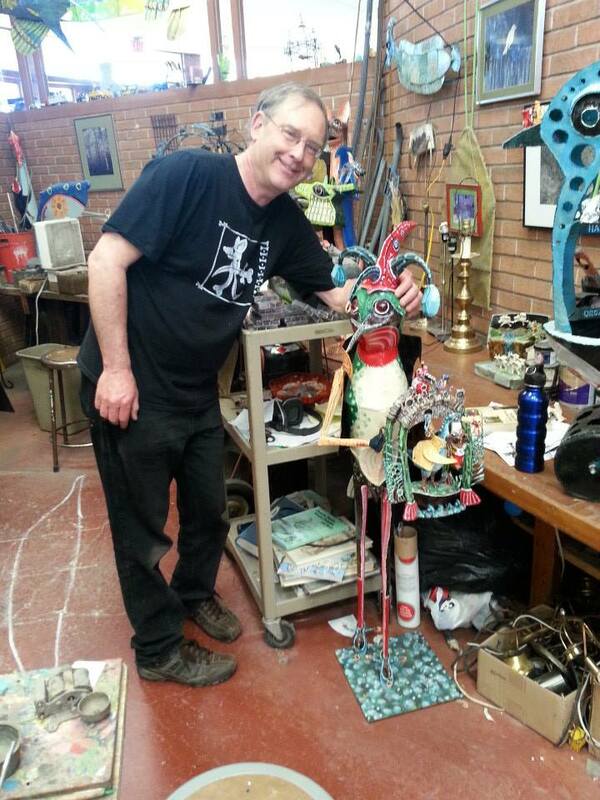 A Studio visit with sculptor Bill Reid is featured on MPTV's "The Arts Page" with Sandy Maxx. Watch Bill Reid in action on The Arts Page! Click HERE to see the studio visit! Sculptor Bill Reid was recently featured in Left of the Lake Magazine, a printed quarterly serving the creative communities from Chicago to Milwaukee. Below is the article by Peg Rousar-Thompson. Bill Reid holding a musical sculpture in his home studio. Visiting an artist’s studio is generally an entertaining and educational experience. Visiting the home and Prairie School studios of sculptor Bill Reid was both of these as well as astonishing, enchanting, and breathtaking. Influenced by nature, automatons, and his own Utopian philosophy, Reid has been creating brightly painted steel sculptures in the form of anthropomorphic creatures, many of which move, for more than twenty years. Full of sass and humor, Bill Reid‘s sculptures are a pleasure to experience. Bill Reid‘s new sculpture “Beeware of Bears Bearing Ice Cream” is quintessential of Reid’s work. Bill Reid‘s tongue in cheek word play is part of the artist’s rich and personal mythology with animals in the starring roles. This fanciful green bear wears a cape shaped like a butterfly but in the colors of a bee. Perched on high healed humming bird shoes, the smiling bear offers some unusual flavors of ice cream cones, including zebra, bluebird, and fox! This beautifully crafted and marvelously painted metal sculpture is 42 inches high and 21 inches wide. Not too big, not too small, but just right! Dist Ants, Bent Rules, and Dodos, a new painted steel sculpture which measures 21x15x7 inches, is Bill Reid‘s latest whimsical commentary in 3-D. A stylishly dressed anteater pushes around a fanciful array of ants who are busy creating lifesavers for the dodo bird in the cart. This charming menagerie inspires delight and wonder in all who behold it. The creatures, painstakingly cut and shaped from steel and exquisitely covered with fantastical painted details have individual personalities, but are united in their efforts. More of Bill Reid’s work, including large scale will be featured in our Summer in Wisconsin exhibition, which takes place July 1 though September 3rd. Please click here to see more of Bill Reid’s creatures.